I think what sets us apart is 'heart'. We all love our beautiful space and the way it's filled, with care, love and laughter. Our amazing patrons are always welcomed 'home' with each visit, and one visit is never enough. 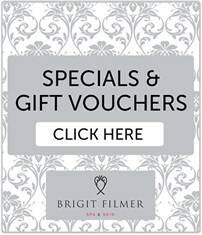 Our Brigit Filmer Spa & Skin family are proudly home grown and we are the brain child of Brigit Filmer a local to the upper highway area. For 33 years our Wellness spa has blossomed from a small home based salon, into an outstanding pillar of the spa community, well respected and honest in all that we practice.